Um...the only one I'm really sure about is Sneasel. I think I also see Mistrevious and Castform. I am reasonably certain I see Kadabra, Gastly, and Lairon. Edit: Well, if it comes down to one of us getting the point, I beat Cal by two minutes, but I'm reasonably certain he was working on his post at the same time I was. My opinion would be that we should both get it, since we came up with it more or less simultaneously. Last edited by JsXtm on Fri May 05, 2006 11:08 am, edited 1 time in total. I can see Slowbro, Kadabra and Jigglypuff. Lol, oh yeah, forgot... Annoying time zones :x Why must earth rotate and why isn't it always day? Last edited by Cal on Sat May 06, 2006 12:26 am, edited 2 times in total. I say you both get none, as you are wrong. No Kadabra! Ignore the blue dots pls. Surprise, I have written up RULES . However, if the same thing happens again where you are both right, THEN I may consider it. I think I see Donphan, Delibird, and Lairon. You may only guess if your cumulative score is 2 or less. Same rules apply, only now 2 (two) may be guessed in each post. ROUND 3 will end in about 3-4 days! As soon as SR gets up, I'm adding I'm OLD pinball sprites too. PS: If you are DYING for more PECs, then wait until I finish hosting this game. I'll open up a NEW PEC which hasn't been done yet. Psybucks WILL be given out to certain people =). Marowak and Entei? Edit: Oh, and one more, Regirock? If I am, my guesses go to Torkoal. I would agree with you, Krisp, but Mutant_Mewtwo already guessed Torkal for this round. OMG I forgot about Torkoal! Mutant_Mewtwo will get his extra point. 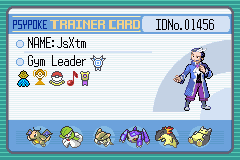 Anyhow, Sneaky_Sneasel has two correct and I'll give JsXtm Poliwag (1 point) for unfairly disadvantaging him. There are still two more to be guessed! No no, S_S guessed Poliwag right, that's his point. I don't want points unless I correctly guess them. Have I mentioned how hard this is? Umm yeah, but he guessed three instead of two. You may now guess 5 (five) pokes, but do so via PM. DO NOT REPLY IF YOU ARE GUESSING. Only 1 (one) PM will be accepted, so choose when it is most advantageous to do so. The round ends when I get enough PMs. Let the 4th round commence! I think I see Camerupt, Corphish, and Dusclops. Ok, the following people have sent me a PM! Krisp, Sneaky_Sneasel, Serpentsounds, Mutant_Mewtwo, Cal, Pimm, mr.m.m.j, and JsXtm. If your name is not on the list, then I have not received your PM, and therefore your guesses DO NOT count. Remember, there is a P50 prize for the non-FEG that places highest! I will be accepting entries until Monday (my time) and after that NO MORE. There is still time to guess! Krisp ~ Campcrupt (sp? ), Metapod, Nosepass, Baltoy, and Rhydon ~ 2 correct! 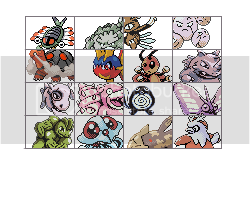 Sneaky_Sneasel ~ Hitmonlee, Dugtrio, Metapod, Illumise, and...Corphish ~ 2 correct! Serpentsounds ~ corphish, metapod, hypno, nidoking, camerupt ~ 3 correct! Mutant_Mewtwo ~ Corphish Metapod Zapdos Nidoking Camerupt ~ 3 correct! Cal ~ Heracross, Metapod and Camerupt Wynaut Ekans ~ 2 correct! Pimm ~ Alakazam Cacnea Camerupt Crawdaunt ~ 2 correct! Mr. MMJ ~ Metapod,Corphish,Nidoking,Camerupt and Kadabra ~ 3 correct! JsXtm ~ Metapod, Tentacool, Parasect, Fearow, and Kadabra ~ 1 correct! tessa7338 ~ Metapod, Alakazam, Corphish, Gyarados ~ 2 correct! SCOREBOARD AS OF ROUND 4! The game ends when I feel like it. In case of a draw, Psybucks will be spread evenly out. Err... that's it I think. DO NOT POST YOUR GUESSES IN THIS TOPIC, that will just defeat the purpose. Yeah, 3 people managed to send me a PM with their guesses, so I'll announce the WINNAHS now. I'll give out psybucks like, tommorow in case anyone feels gibbed. So you all have 24 hours to complain before my desicions are final.